Mercy Medical Center in Redding, Calif., is at the center of the lawsuit. California's largest medical association is joining the fight against Dignity Health over its refusal to allow a woman to get her tubes tied during a cesarean section. The California Medical Association filed a motion last week in state court asking a judge to allow it to join the ACLU in the case against Dignity. The ACLU alleges in the lawsuit, filed last year, that Rebecca Chamorro decided with her doctor that she would get a tubal ligation during her scheduled C-section in January at Mercy Medical Center in Redding. But the hospital allegedly would not allow the procedure, citing the Ethical and Religious Directives for Catholic Health Care Services. According to the directives, “Procedures that induce sterility are permitted when their direct effect is the cure or alleviation of a present and serious pathology and a simpler treatment is not available.” But performing tubal ligation immediately following delivery aligns with medical standards of care, according to the ACLU. Dignity said in a statement that it was disappointed in the association's decision to join the ACLU suit. “Our hospitals are open with physicians seeking practice privileges about the services we offer and do not offer,” according to the statement. 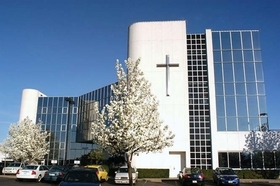 “Our Catholic hospitals make clear that they operate in accordance with the Ethical and Religious Directives for Catholic Health Care Services.” Dignity has also argued in court documents that Catholic hospitals have the right not to perform sterilization procedures.